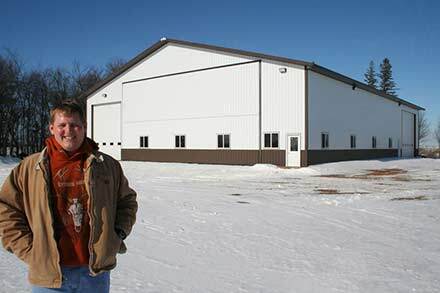 Kurt Sandgren of Hector has used his new 72' x 120' cold storage building with two Schweiss bifold doors on it. 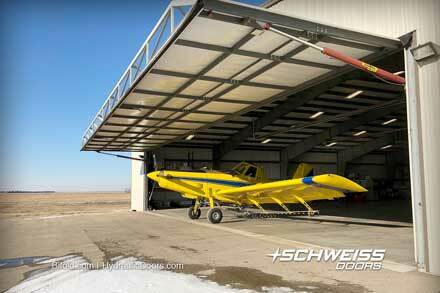 "I think the Schweiss doors are very well built and pretty trouble-free. I like the remote access. 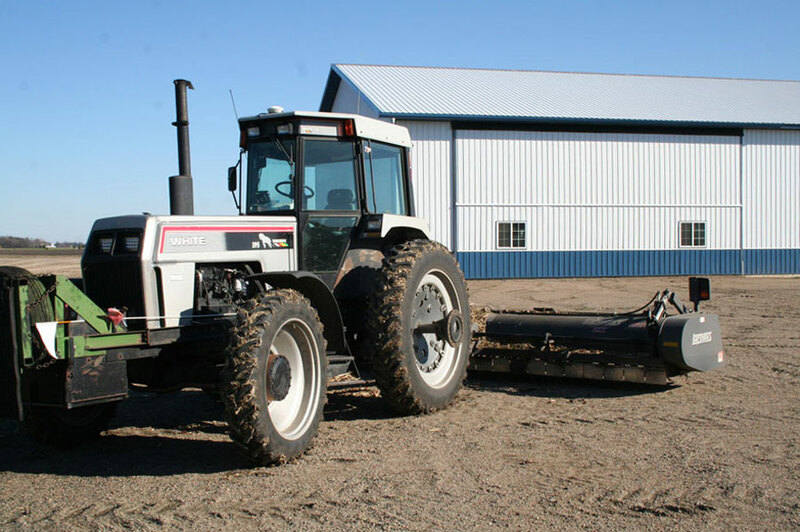 The straps are a way better deal than the cable system. 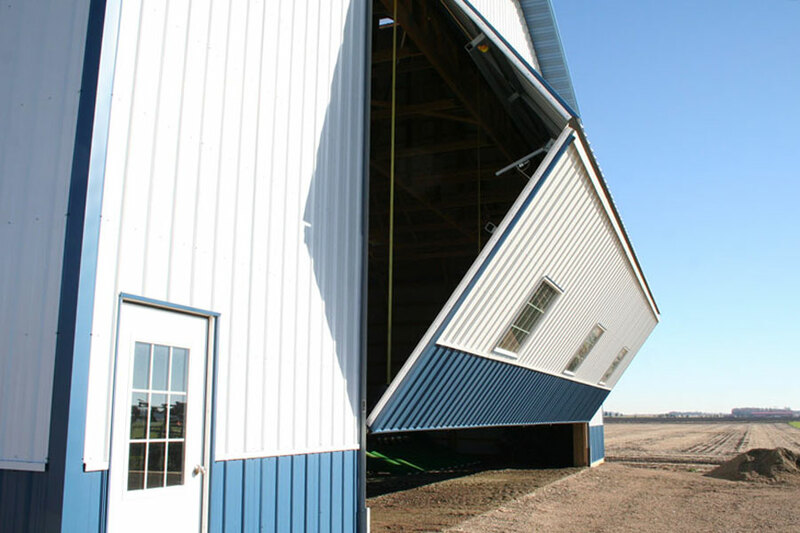 I like the doors for their speed. 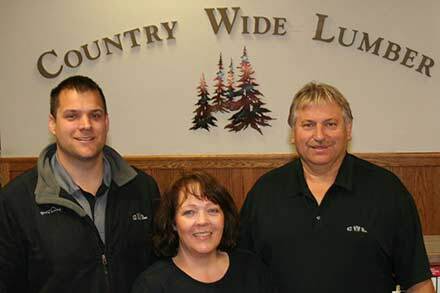 I put the windows in and like having the extra light when they are closed. 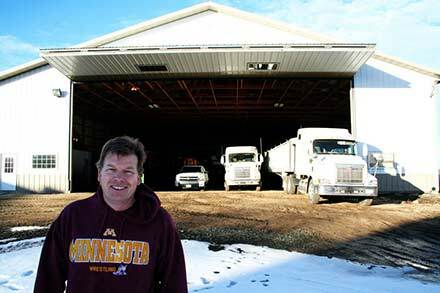 The well designed autolatch system I wouldn't be without — it makes for no mistakes when you are opening and closing them and it's secure." 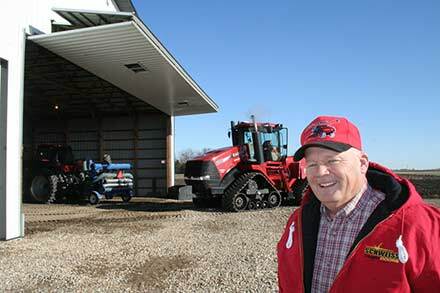 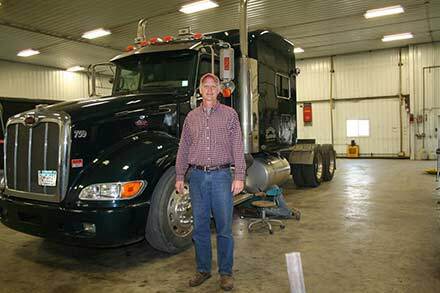 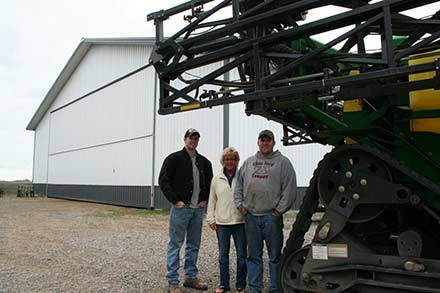 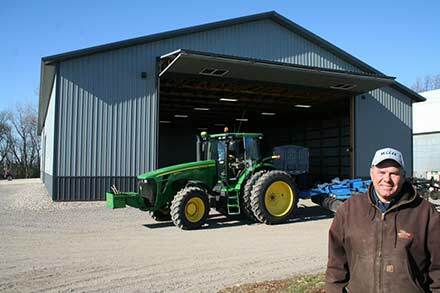 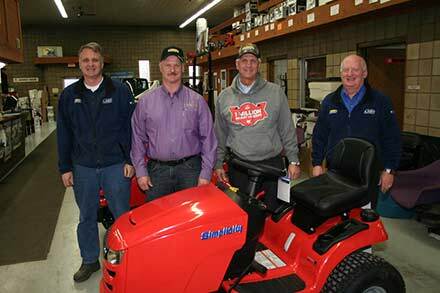 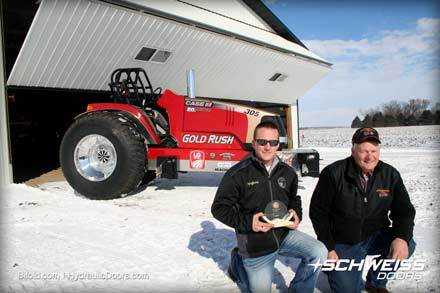 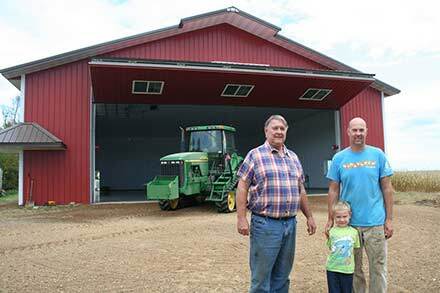 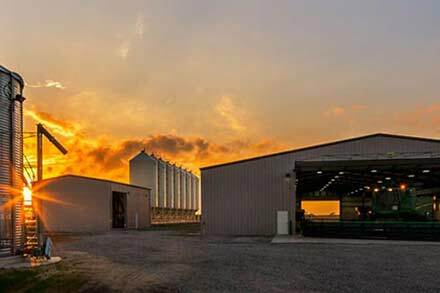 Sandgren, who farms little over 1,000 acres of a mixed crop of corn, soybeans, sweetcorn, peas and sugarbeets, gave Schweiss Doors another call years later when he built a new 72' x 120' machine shed at his Hector farmsite. 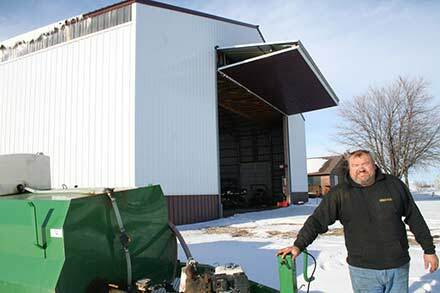 His first door, a 27' 11" x 16' bifold liftstrap with autolatches and a freestanding header, went on a quonset building nearly 10 years ago. 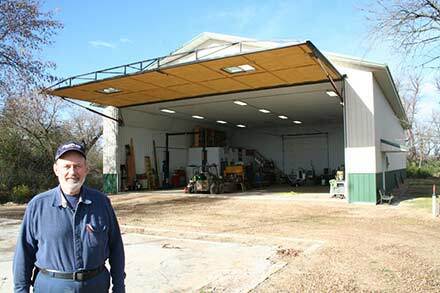 His new modern machine shed called for two larger bifold doors, a 48' x 20' and a 40' x 17.6', also with autolatches, liftstraps and remote openers. 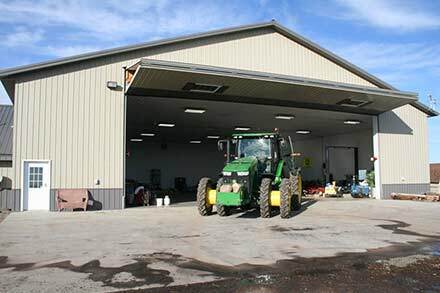 To bring in additional daylight into the building and to give it a dressed-up look he placed three decorative windows on the larger door and two on the 40' door. 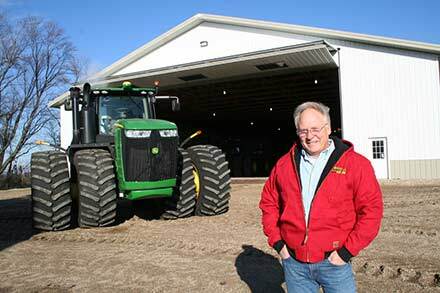 Sandgren said he has been farming all his life, but he chuckled, only as a profit since 1980. 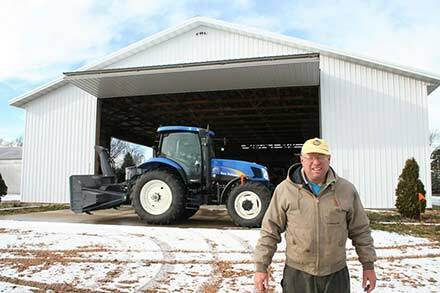 He's farming on the original 160 acres of land his great-grandfather, Oscar, started on. 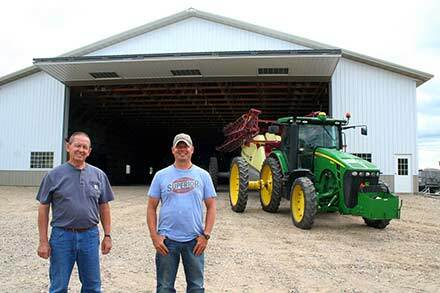 Now, the land gets worked by his son, Matthew 28, and his father, Douglas, 81, who still does a lot of tillage, tractor and combine driving for Kurt. 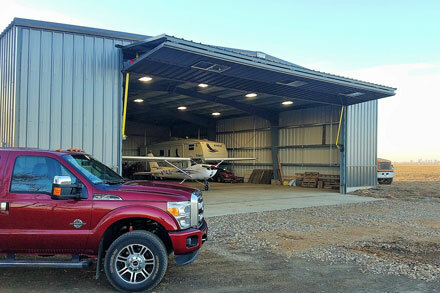 "I looked at a hydraulic door for the west sidewall of the building where there is a massive I-Beam, but it wasn't going to save a lot of headroom so I went with the bifold door. 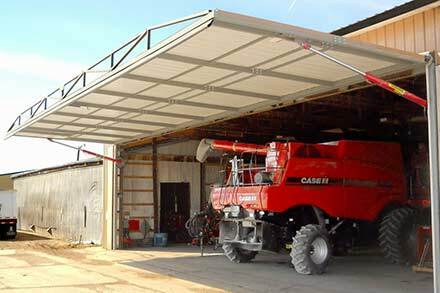 I will say, having two doors just makes the shed a lot more accessible; you're not constantly moving stuff to get at stuff at the back of the shed. 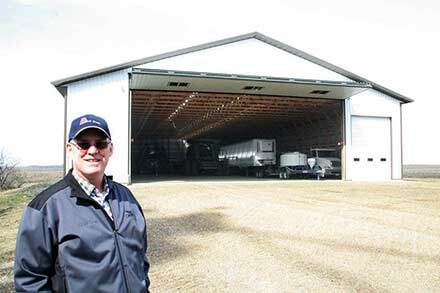 I use my doors a lot and needed the width and height," said Sandgren. 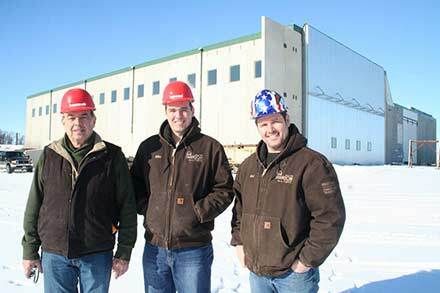 Sandgren said he didn't check with any other manufacturers, he knew where he wanted to get his doors from. 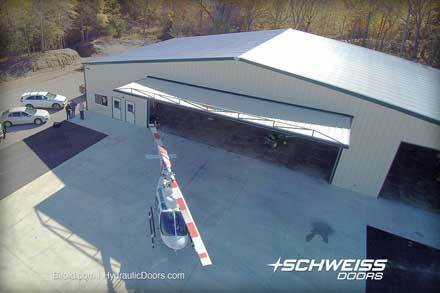 "I think the Schweiss doors are very well built and pretty trouble-free. 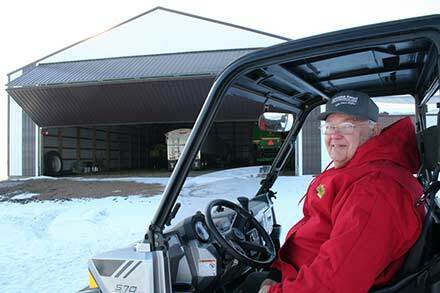 I like the remote access. 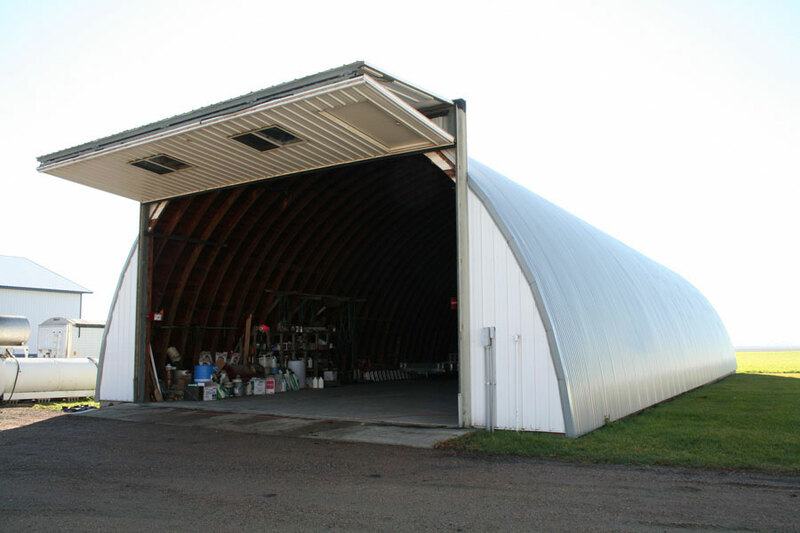 The one on the old quonset gets pretty much used a lot as a garage for my pickup. 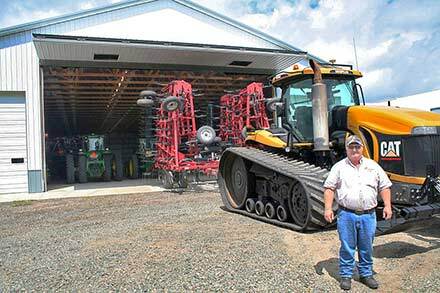 The straps are a way better deal than the cable system. 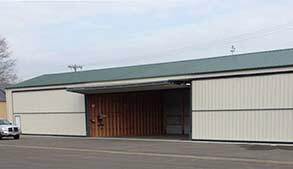 I like the doors for their speed. 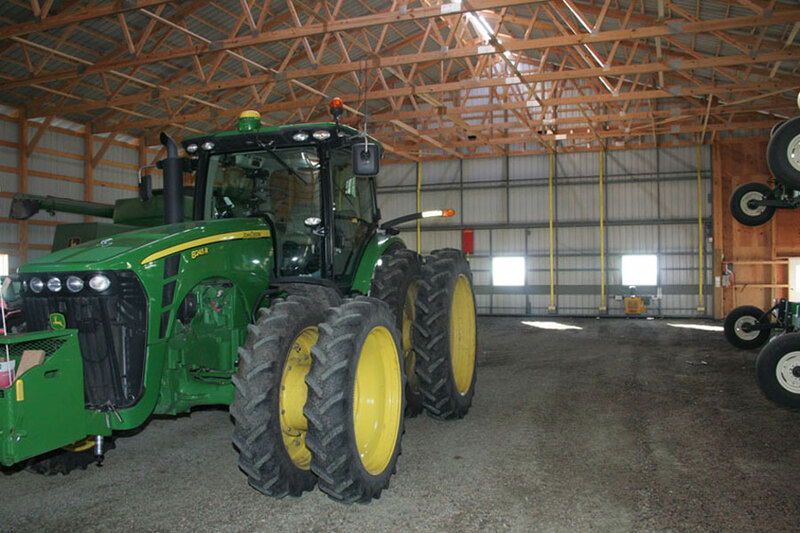 I put the windows in and like having the extra light when they are closed. 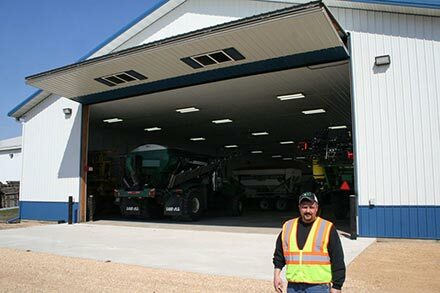 The well designed autolatch system I wouldn't be without — it makes for no mistakes when you are opening and closing them and it's secure," commented Sandgren. 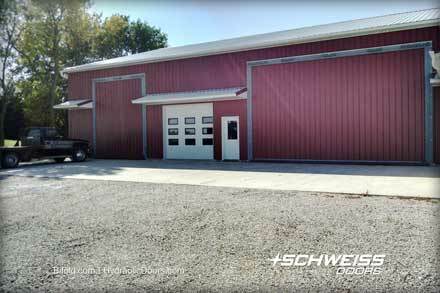 He recommends Schweiss doors to others and tells them Schweiss does a nice job building doors and has a good reputation for servicing. 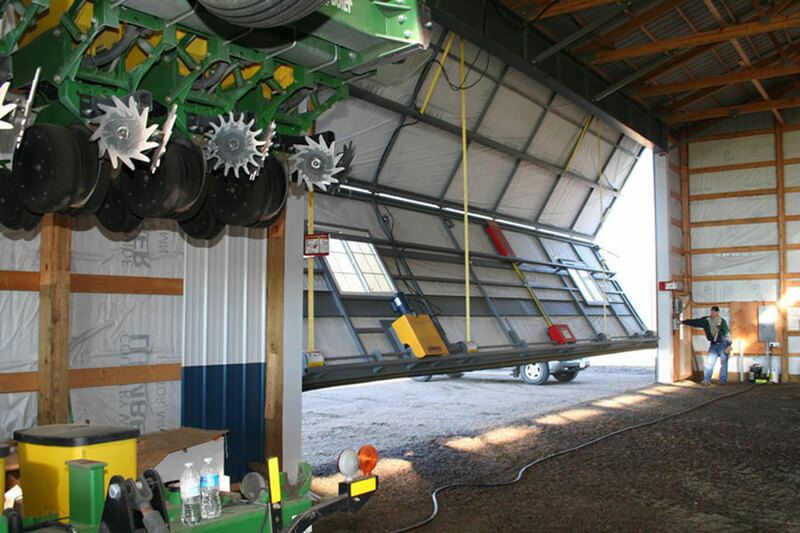 This 20 ft. tall bifold liftstrap door gives Sandgren more than enough headroom for his tractors, combine and other farm equipment. 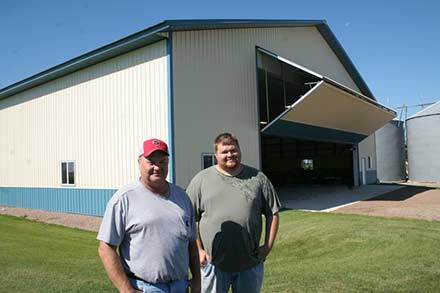 The Schweiss bifold door with decorative windows and blue and white color scheme give the Sandgren Farms newest building a very impressive look. 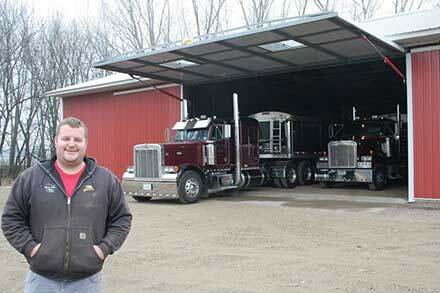 Kurt Sandgren likes the fact that having two bifold doors on his machine shed gives him better access to equipment in it. 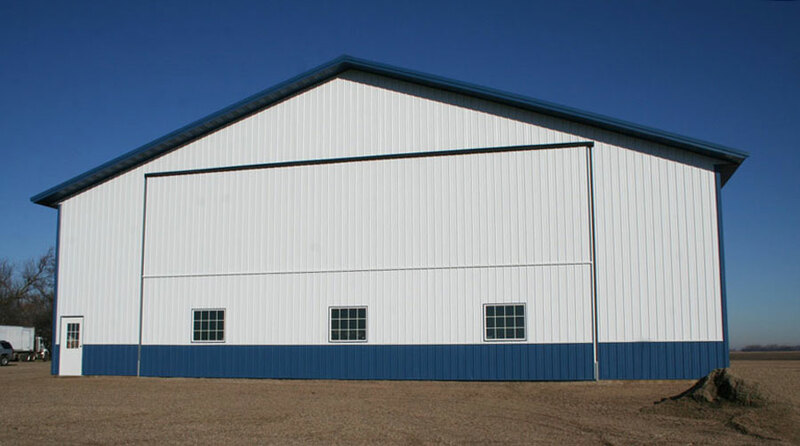 This 72' x 120' building has a 48' x 20' endwall door and a 40' x 17.6' sidewall bifold door on it. 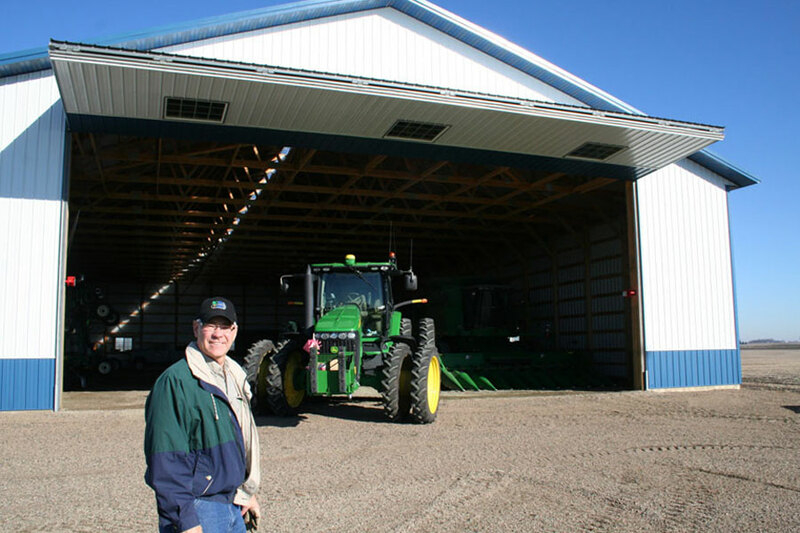 From a distance you can see how his buildings are laid out on the farmsite. 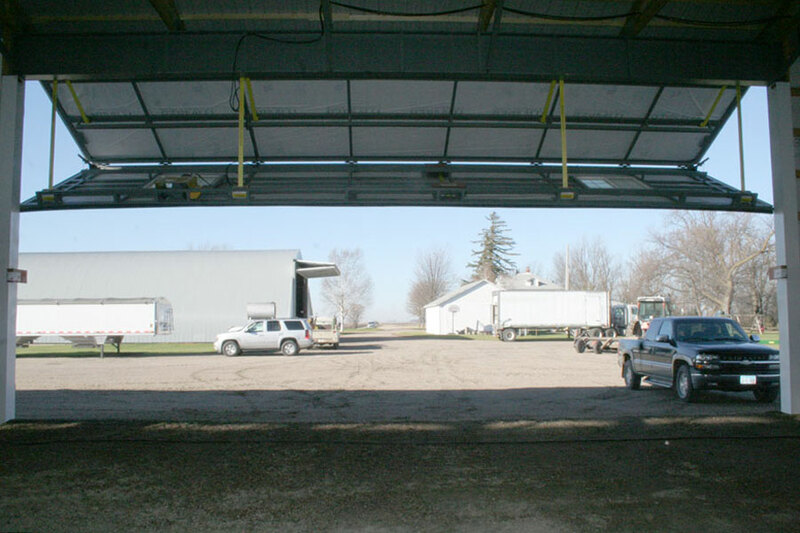 His quonset hut at the left also has a Schweiss bifold liftstrap door on it. 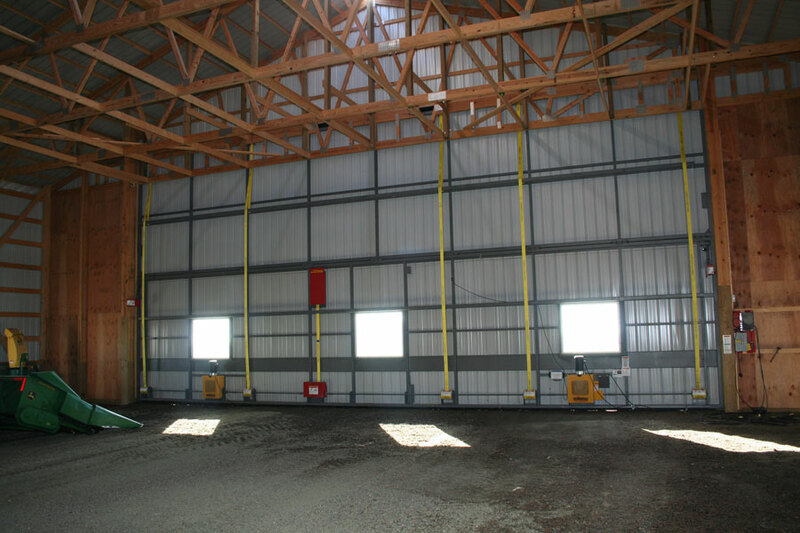 When it comes to moving equipment in and out of a large building, an end bifold door and sidewall bifold door make the job much easier and quicker. 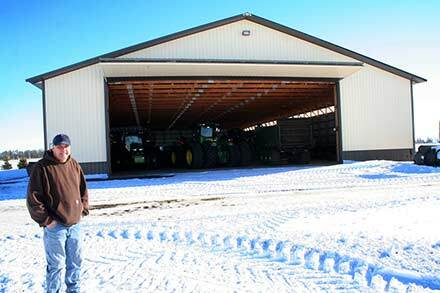 There's room to spare inside the machine shed now, but as the harvest season ends the building will get filled with other equipment. 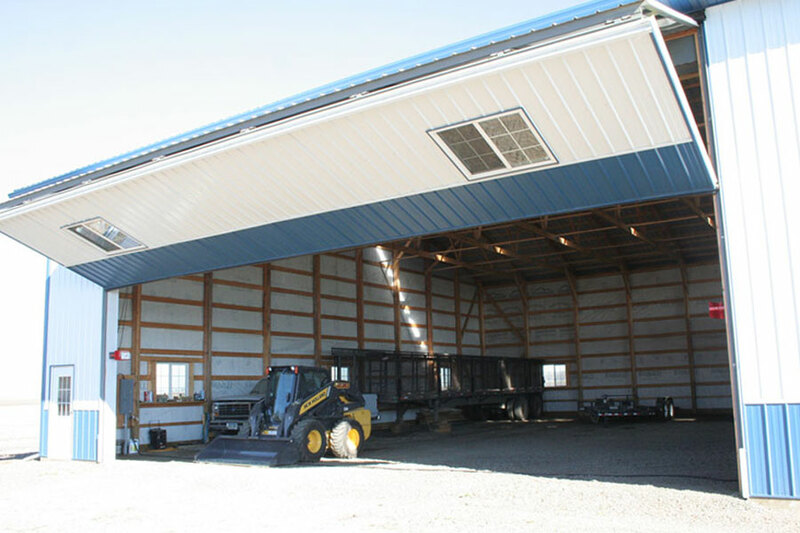 Many door owners prefer the bifold door because they can park their skidloader or other snow removal equipment inside for easy snow removal after opening the door. 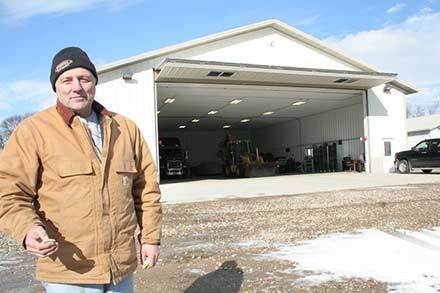 Sandgren says he likes the bifold door for its opening speed and says he wouldn't have a door without the Schweiss autolatch system. 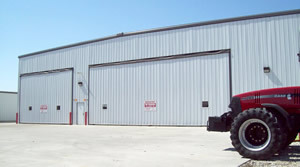 Three large door windows and other windows in the building allow ample daylight in. 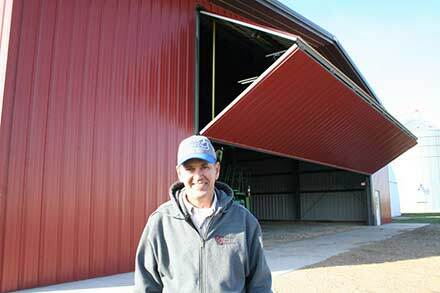 This westside bifold liftstrap door opens up to give a view of his quonset building bifold door. 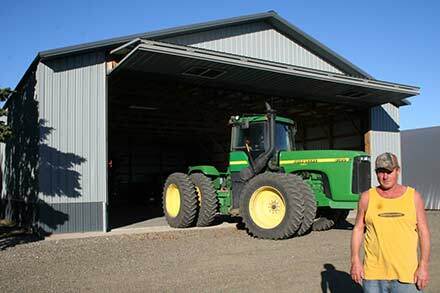 Sandgren's tractor and Loftness shredder in front of the 40' x 17.6 bifold westside door. 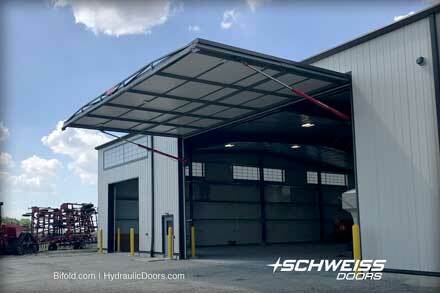 Schweiss bifold liftstrap doors can be stopped at any level, a nice feature for heated buildings. 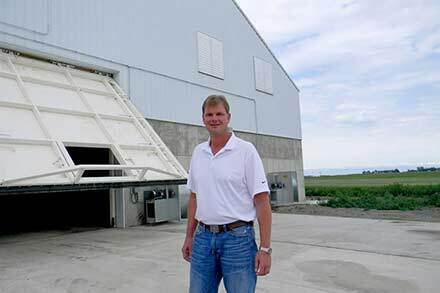 Kurt Sandgren pushes the opening button on his 40' sidewall door. 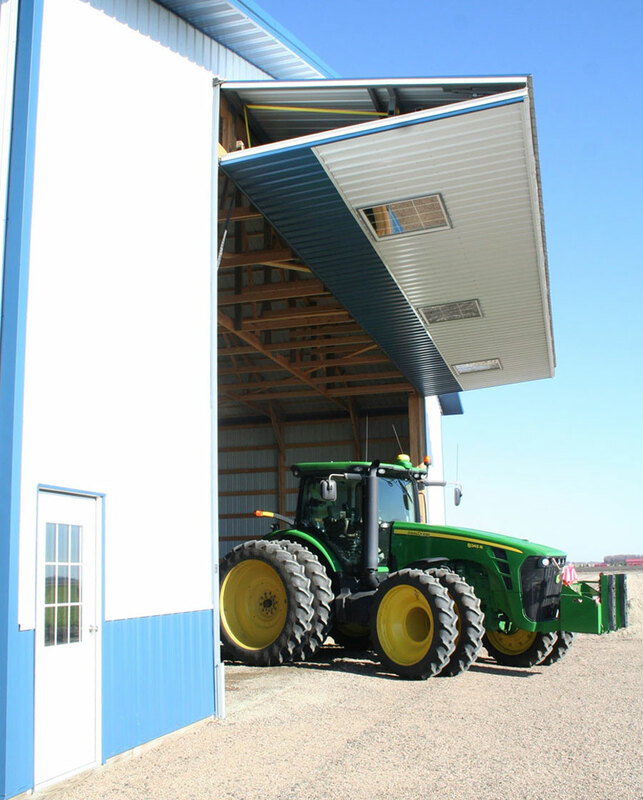 He also has a remote opener for this door. 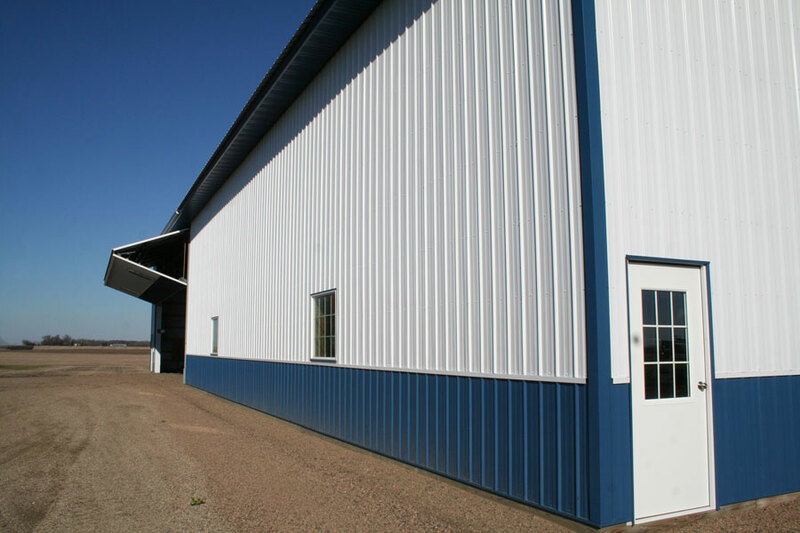 This quonset building bifold liftstrap door has a freestanding header for extra support. 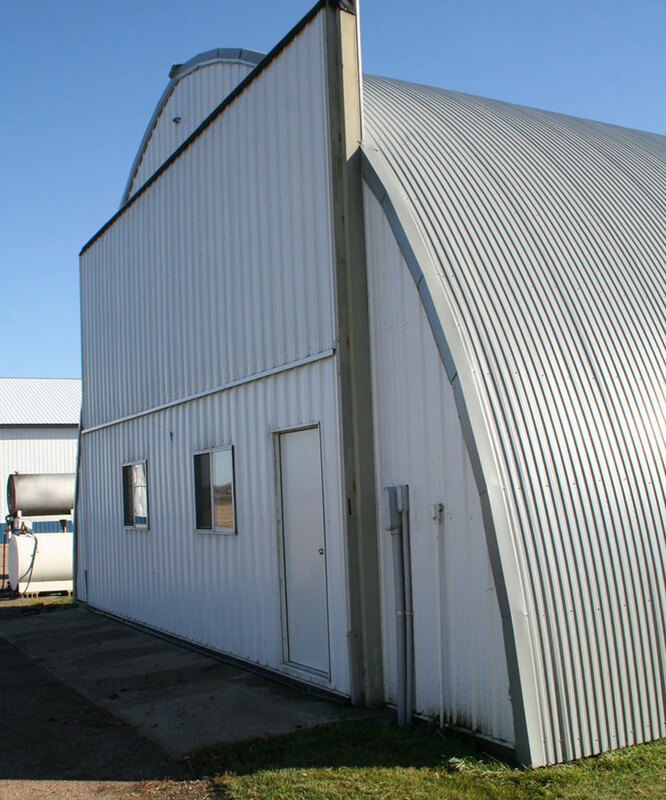 Sandgren says he uses this quonset building with a bifold door on it a lot. 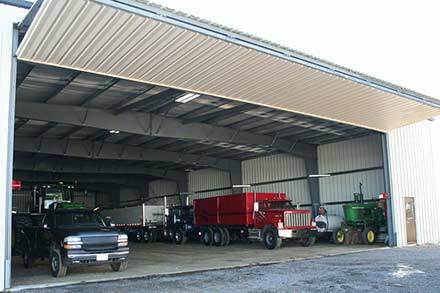 Among other things it serves as a garage for his pickup.